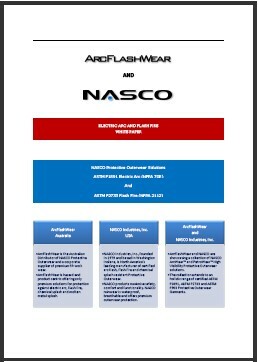 ArcFlashWear is the Australian Distributor of NASCO Protective Outerwear Solutions and a corporate supplier of premium FR work wear, offering protection against the three major industrial hazards: electric arc, flash fire and molten metal splash. We are product and hazard centric, offering only a select number of the world’s premium FR textiles in our standard and custom range. Catastrophic accidents caused by electric arc, flash fire and molten metal can inflict severe second and third-degree burn injuries and in some instances, cause death. Electric arc and flash fire incidents are unexpected and uncontrolled events that can occur over a broad range of exposures. To ensure proper protection, corporations must perform hazard risk assessment analysis and install FR work wear programs based on the probable worst case exposure for a workplace task. When body burn injury is reduced, the survival rate for burn victims is significantly increased and the ability to preserve the victim’s quality of life is greatly enhanced. Our select group of premium textiles comply with the testing requirements of the American Society for Testing and Materials (ASTM), National Fire Protection Association (NFPA), Canadian General Standards Board (CGSB) and European Standards (ENs). These organisations publish the world’s most authoritative standards for testing materials against a wide range of exposures. Their standards ensure that products and services are safe, reliable and of good quality. Electricity is often referred to as a ‘silent killer’ however electric arc and flash fire incidents can also be fatal. PPC programs backed by proven performance must be installed to provide the correct level of workplace protection. This White Paper examines these hazards and offers program solutions that help protect against these potential killers (1.37 MB.pdf).